General anesthesia is the use of medications to put the entire body to sleep. It puts you into a state of unconsciousness. During this time, the brain cannot feel any pain. Doctors trained in anesthesia carefully balance the amount of medication needed by keeping an eye on vital signs. Your health history and your family's health history—Tell your doctor if you have had anesthesia before and your reaction to it. Tell your doctor about your family's history with anesthesia. Medications that you take, including herbs and supplements—These can have an effect on how the anesthesia works. You will need to fast the night before surgery. You may need to take certain medications in the morning before surgery. Induction phase—Medications will be given that result in the loss of consciousness. These will be given through an IV or through gas into the lungs. 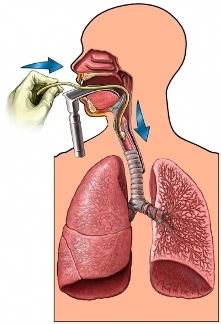 A breathing tube will be placed down your windpipe. This will be attached to a machine that helps you continue to breathe normally. Middle or maintenance phase—Medications will be given based on your responses. They will help to keep you asleep or regulate your body functions. Recovery or emergence phase—The doctor will slowly reverse the anesthesia. New medications will allow you to wake up. When you are starting to awaken and are breathing on your own, the breathing tube will be removed. As you wake up, you will be watched closely for any problems. Any pain and discomfort caused by the surgery itself can be managed with medications. The length of time anesthesia is needed will depend on the type of surgery. General anesthesia numbs all pain. Since you are asleep, your brain will not sense any pain signals. When you have recovered from anesthesia, you will be sent to a hospital room or home. For the first 24 hours or longer, avoid doing activities that require your attention, such as driving. Anesthesia—what to expect. Kids Health—Nemours Foundation website. Available at: http://kidshealth.org/en/teens/anesthesia.html. Updated September 2015. Accessed October 2, 2017. General anesthesia. American Pregnancy Association website. Available at: http://americanpregnancy.org/labor-and-birth/general-anesthesia. Updated August 2015. Accessed October 2, 2017. Pollard R, Coyle J, Gilbert R, Beck J. Intraoperative awareness in a regional medical system: A review of 3 years' data. Anesthesiology. 2007;106(2)269-274. Sackel DJ. Anesthesia awareness: an analysis of its incidence, the risk factors involved, and prevention. J Clin Anesth. 2006;18(7):483-485.